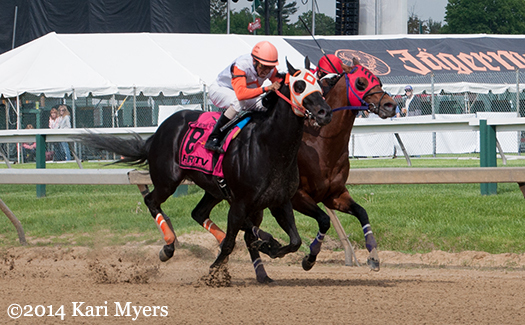 May 17, 2014: Elevated (#11) in the James W. Murphy Stakes at Pimlico. 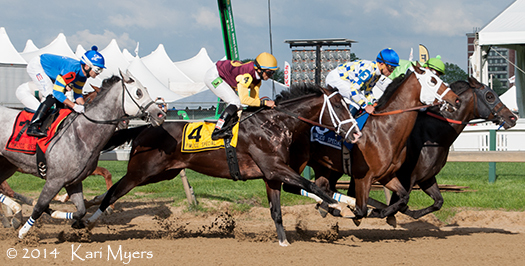 May 17, 2014: Elevated approaches the Pimlico starting gate. 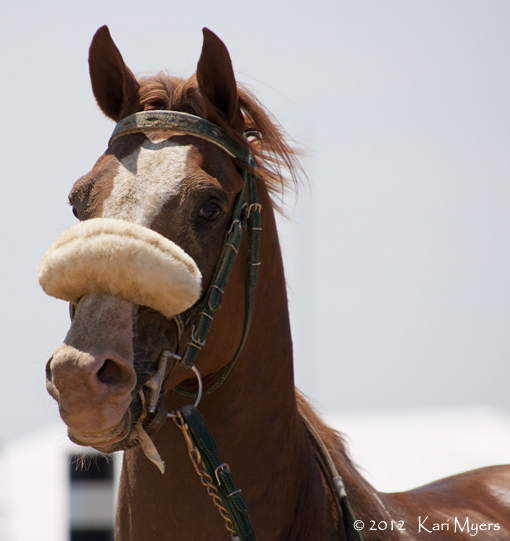 It turns out there’s a good reason for this gorgeous guy to wear those blinkers. 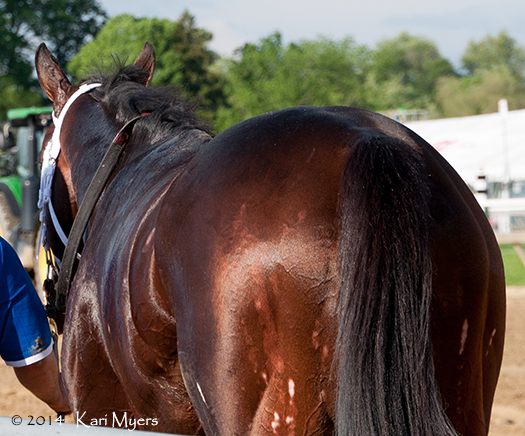 May 17, 2014: Elevated heads back to the barn after the James W. Murphy Stakes. He only has one eye! May 17, 2014: Elevated’s blind side. 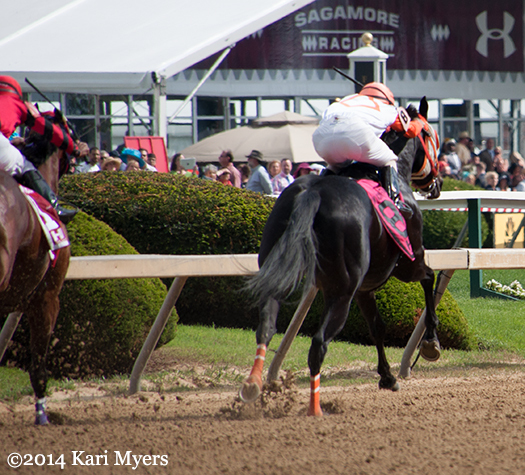 May 16, 2014: Ben’s Cat charges down the stretch at Pimlico. 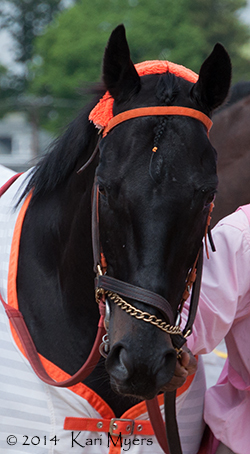 Ben’s Cat is one of those horses that almost always finds a way to win, having a record to date of 41 starts, 27 1st place finishes, 4 seconds, and 3 thirds with earnings of over $2.1 million. The tough little gelding turned eight years old in 2014, but that hasn’t slowed him down. While we were in Baltimore for the Preakness, we had the pleasure of seeing his versatility on display as he won the Jim McKay Turf Sprint for the third time–a race that actually came off the turf and was run on the main track due to a ton of rain the night before. We have the owner, trainer, and breeder of Ben’s Cat to thank for his longevity. King Leatherbury gave him the time and care necessary to recover from a broken pelvis at age 2, so that he would finally make the races at age 4. The rest is history! 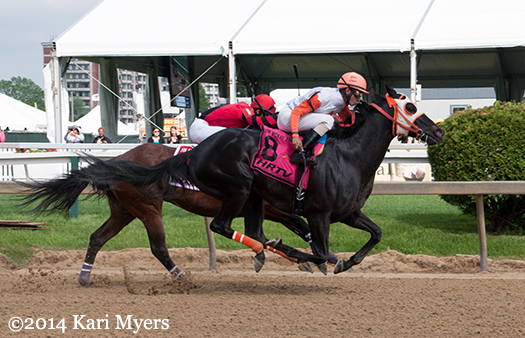 May 16, 2014: Ben’s Cat catches up to Great Attack in the off-the-turf Jim McKay Turf Sprint. 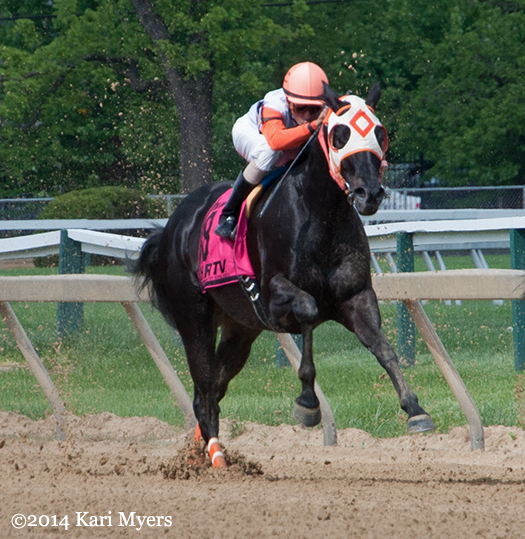 May 16, 2014: Ben’s Cat puts a head in front of Great Attack in the Pimlico stretch. May 16, 2014: Ben’s Cat, the hover horse. May 16, 2014: This is usually what most horses see of Ben’s Cat. 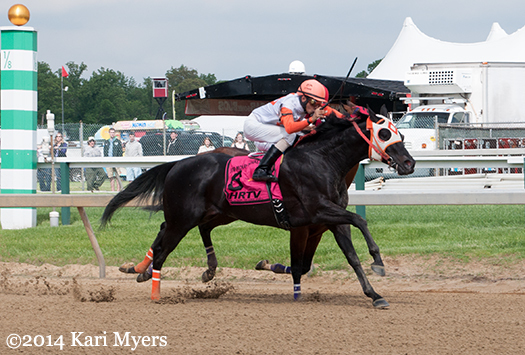 May 17, 2013: Ben’s Cat catches up to Bridgetown and Spring to the Sky on his way to win the 2013 Jim McKay Turf Sprint. May 16, 2014: Ben’s Cat. 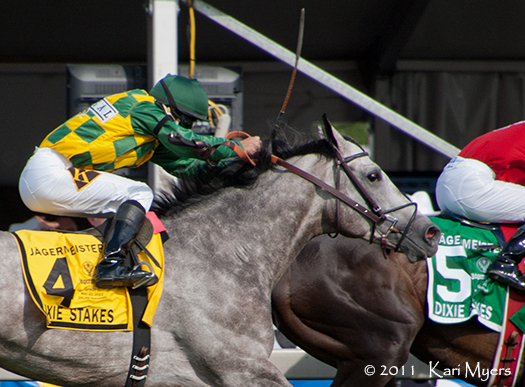 May 21, 2011: Paddy O’Prado and Kent Desormeaux in the stretch of the Grade 2 Dixie Stakes. 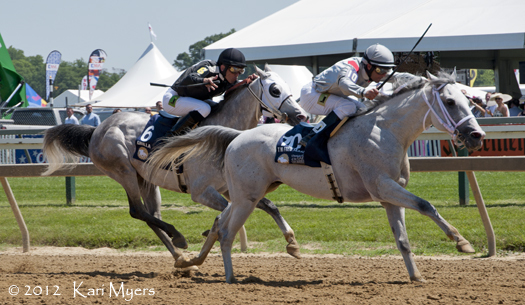 Paddy O’Prado was one of my favorite 3-year-olds of 2010, and I was at Pimlico on Preakness day in 2011 to see him win the Grade 2 Dixie Stakes. He sustained an injury in that race, so it unfortunately turned out to be his final start. He’s now standing at Spendthrift Farm in Kentucky and his first crop of foals are yearlings as of 2014. Paddy is by the fantastic Irish-bred stallion El Prado out of the mare Fun House, who was a Grade 2 winner herself during her racing days. Fun House is also the dam of recent Kentucky Oaks winner, Untapable. 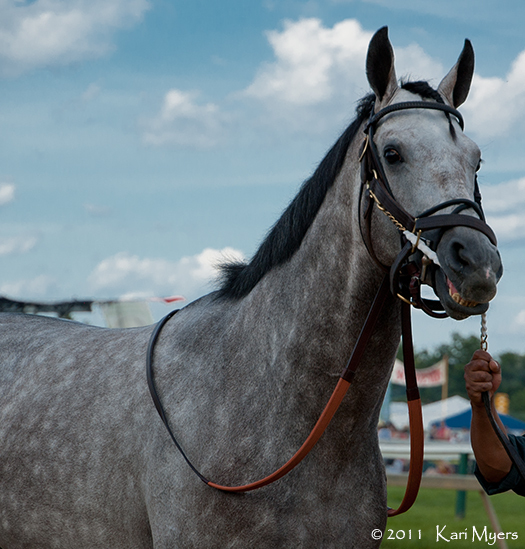 May 21, 2011: Paddy O’Prado at Pimlico for the Dixie Stakes. 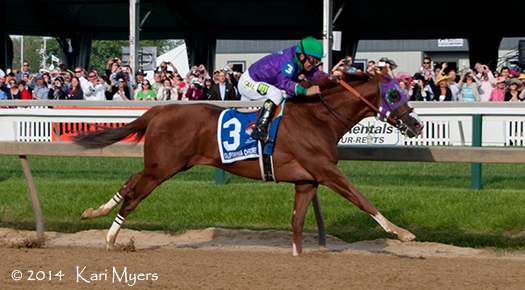 May 17, 2014: California Chrome and Victor Espinoza in the stretch of the Preakness. 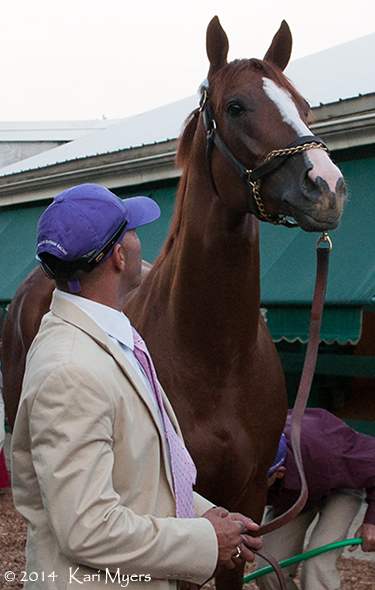 California Chrome is heading into Saturday’s Belmont as a huge favorite, and deservedly so. 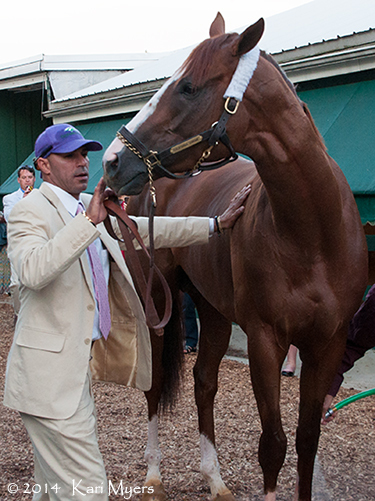 Here’s hoping that his win streak continues and that he gives us a Triple Crown! I won’t be in New York to witness it in person, but I was able to get to the Kentucky Derby and Preakness this year. 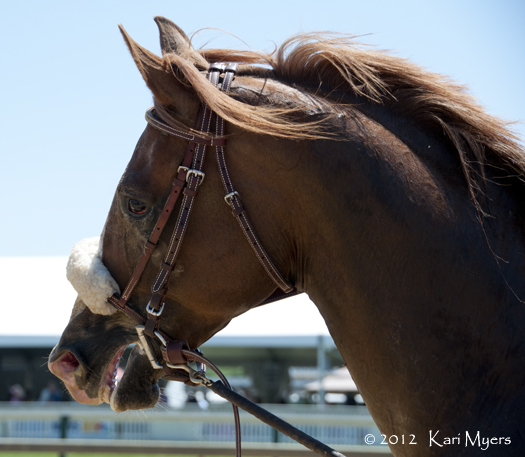 The photos included here are from Churchill Downs and Pimlico. What a handsome colt. 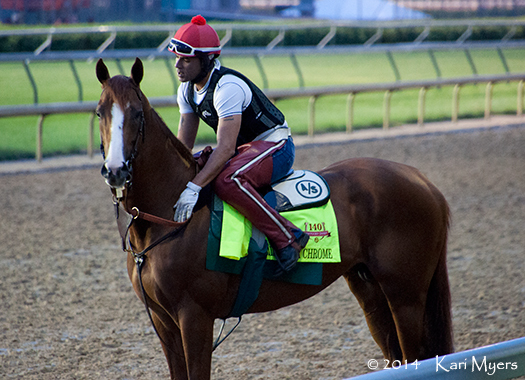 May 1, 2014: California Chrome and exercise rider Willie Delgado at Churchill Downs. 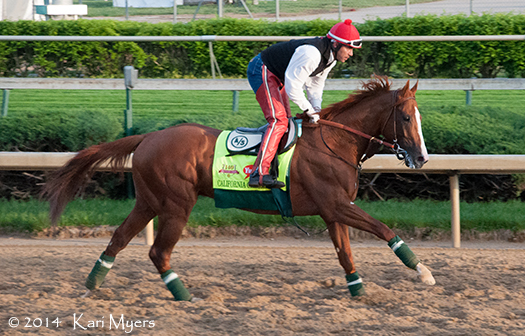 May 1, 2014: California Chrome gallops at Churchill Downs. 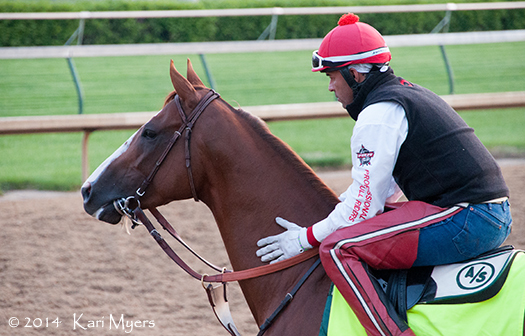 May 1, 2014: California Chrome and Willie Delgado at Churchill Downs. A big thank you to my friend Amy for the following two photos of California Chrome getting a bath. She braved a huge throng of reporters, photographers, and fans to get these pictures. Huge. She and I have put thousands of miles on my car while traveling to Kentucky, Maryland, and Virginia for racing and sales. I’m staying home for the Belmont, but she’ll be there! Yes, I’m completely and utterly jealous. 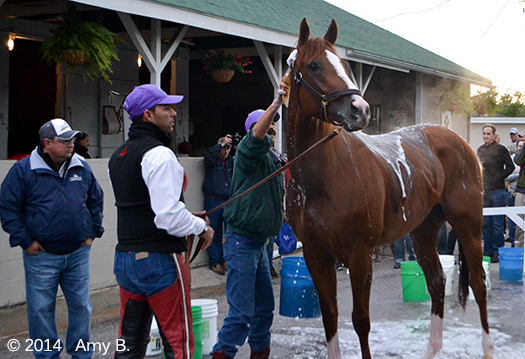 May 1, 2014: California Chrome gets a bath at Churchill Downs. 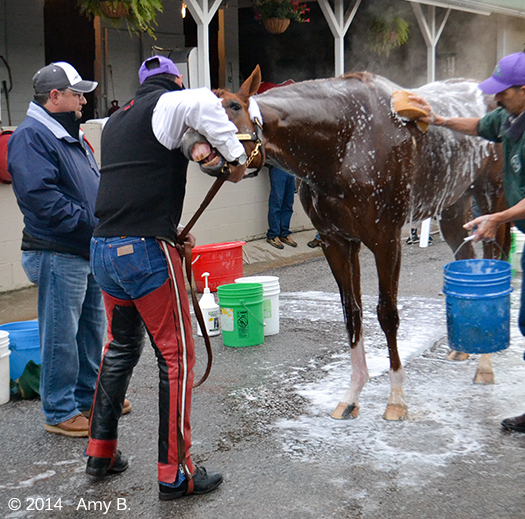 May 1, 2014: A rather goofy, playful California Chrome gets a bath at Churchill Downs. 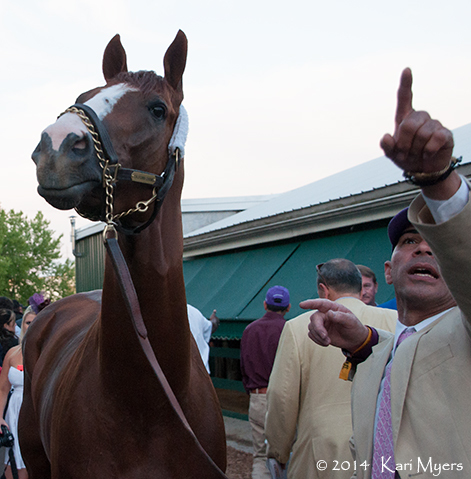 May 17, 2014: California Chrome is led over for the Preakness. 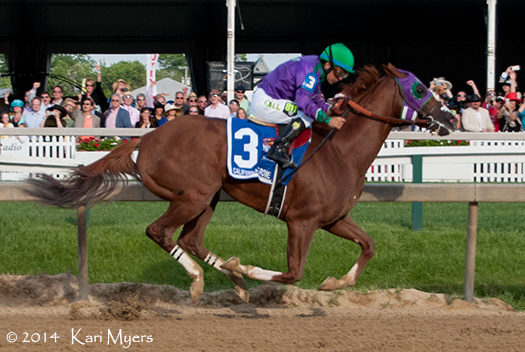 May 17, 2014: California Chrome and Victor Espinoza take off to win the Preakness by 1 ½ lengths. 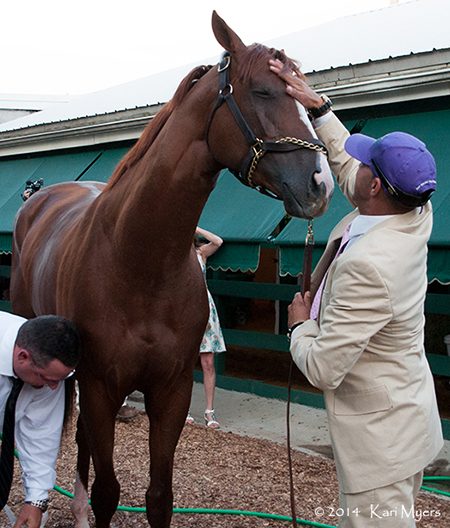 May 17, 2014: California Chrome gets some love from Willie Delgado after his win in the Preakness. 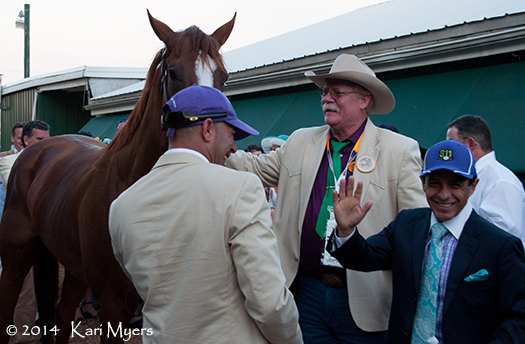 May 17, 2014: California Chrome and his happy people after the Preakness: Willie Delgado, Steve Coburn, and Victor Espinoza. 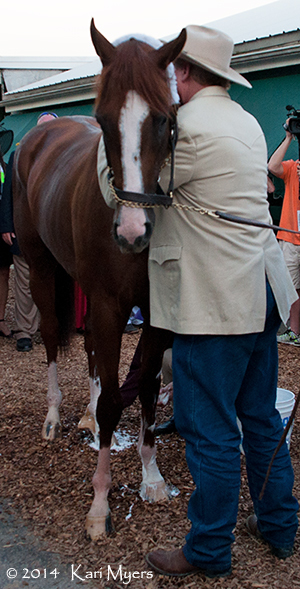 May 17, 2014: California Chrome gets a hug from co-owner Steve Coburn after the Preakness. May 17, 2014: What exactly do you mean by “no”? May 17, 2014: Look, a helicopter! 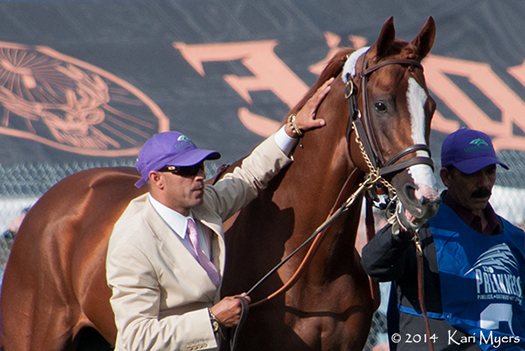 May 17, 2014: California Chrome after his bath. 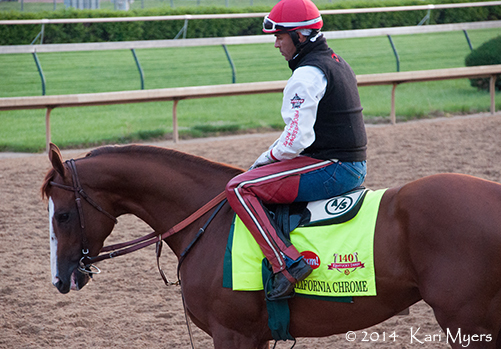 Apr 30, 2014: California Chrome. May 16, 2014: Golden Lad has an interesting coat pattern. Golden Lad is a Medaglia d’Oro half-brother to stakes winner R Gypsy Gold and Grade 2 winner Broadway’s Alibi, who was also 2nd in the 2012 Kentucky Oaks. Golden Lad is a Grade 3 winner himself, having won the Razorback this year at Oaklawn Park. The first thing you’ll notice about him is his coat, which looks a bit like it was doused in bleach. I’m sure there’s a perfectly scientific explanation behind it, but I was never a student of genetics. 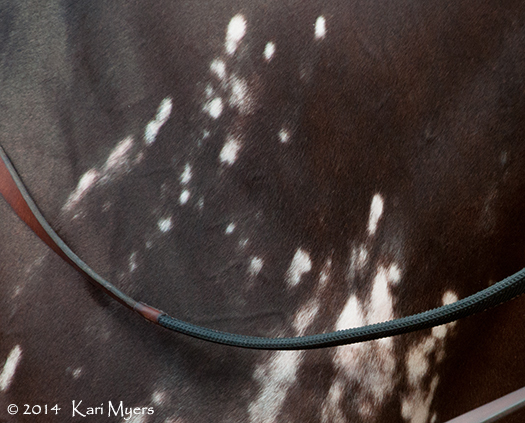 The spots aren’t confined to his chest, as they continue around his girth and trail down his hind end. 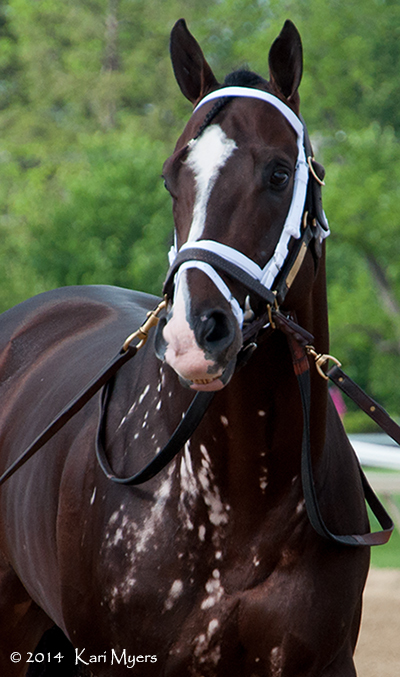 I kept seeing him galloping at Churchill Downs, but at first I thought it was just a colt covered in lather. 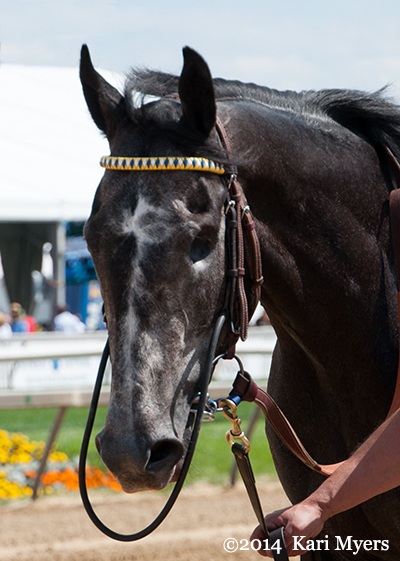 It wasn’t until I saw him in the field for the Pimlico Special that I realized who those spots belonged to. 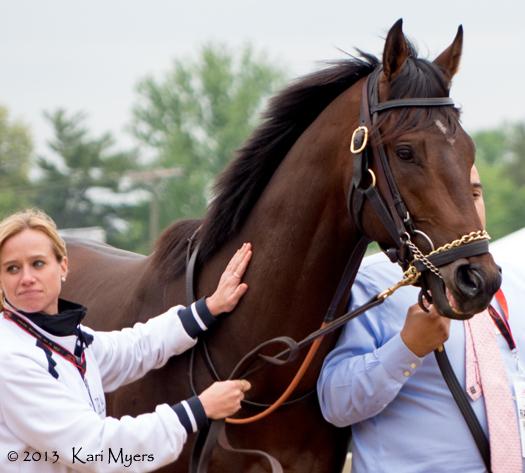 May 16, 2014: Golden Lad on his way to be saddled for the Grade 3 Pimlico Special. May 16, 2014: Golden Lad’s shoulder spots. May 16, 2014: Spots on the other side, too. 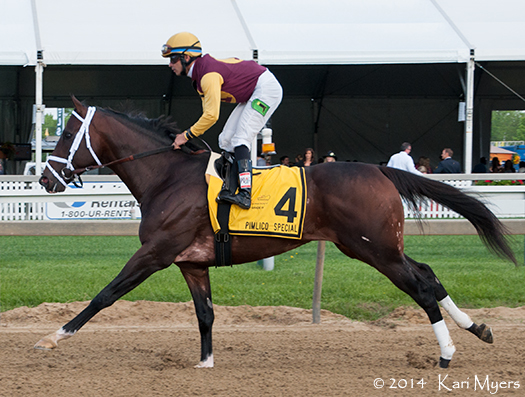 May 16, 2014: The Grade 3 Pimlico Special. May 16, 2014: Golden Lad’s spotted hind end. 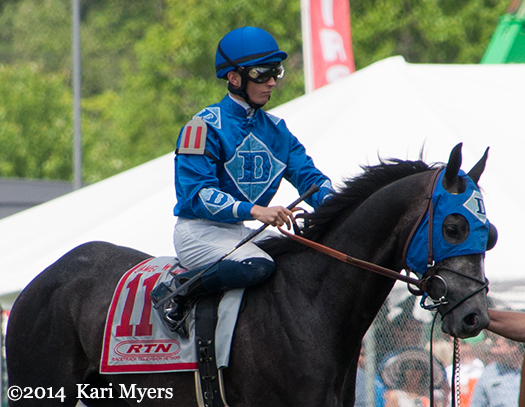 May 17, 2014: Allstar heads back to the barn after running 4th in the James W. Murphy Stakes at Pimlico. 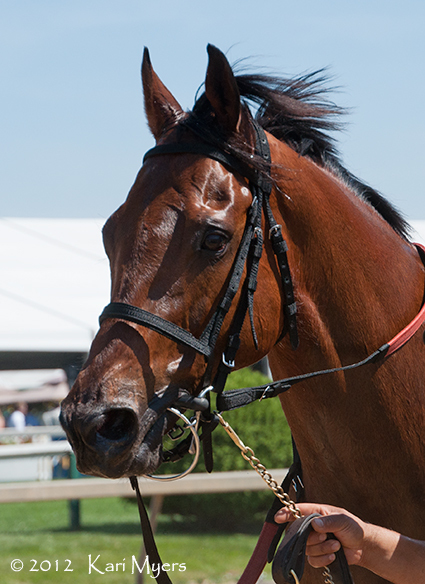 This handsome 3-year-old gelding is Allstar, a son of Flower Alley trained by Marcus Vitali. 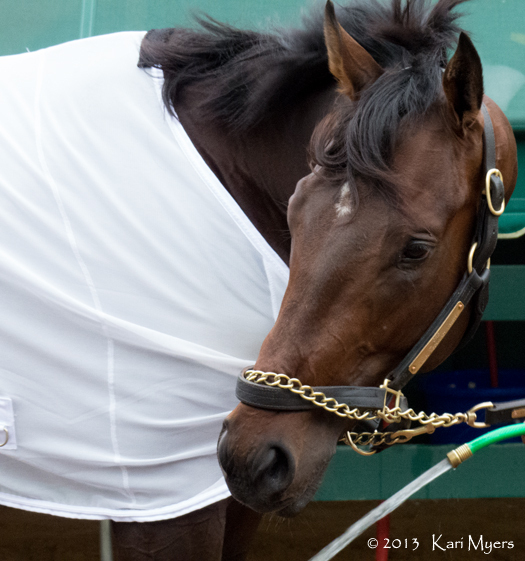 He ran 4th on the turf in the James W. Murphy Stakes at Pimlico on the Preakness undercard, and I thought he was absolutely stunning. Allstar tried Grade 1 company in the Florida Derby earlier this year, but came in a distant last to the winner, Constitution. 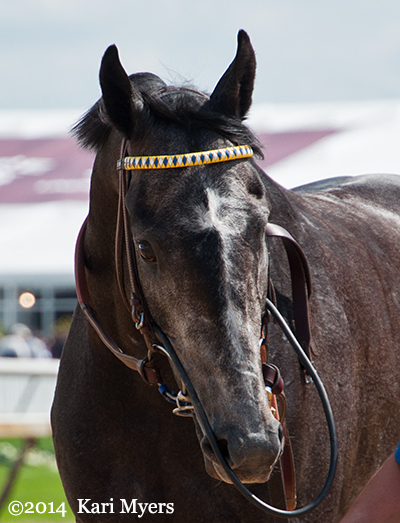 May 17, 2014: Allstar checks out the crowd at Pimlico. 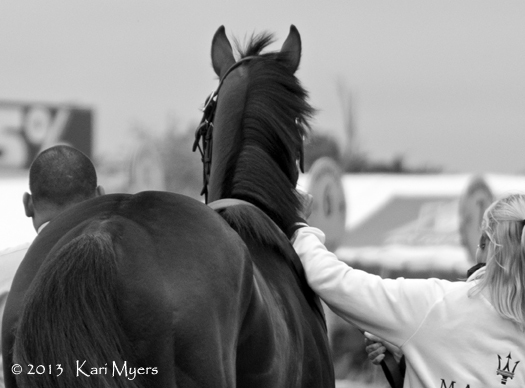 May 19, 2012: Immortal Eyes heads back to the barn at Pimlico after his run in the Maryland Sprint Handicap. Immortal Eyes has had quite the career, and became a millionaire in 2013 by doing it the hard way: 48 starts with 18 wins, 13 seconds, and 4 thirds. That’s quite a record, and what a gelding! I’m not sure if he’s still in training since he just turned 9 this year, but I hope that he’s happy and healthy wherever he is! I’ve followed Thoroughbred racing for as long as I can remember, but every now and then tracks will throw in a real treat for the crowd. 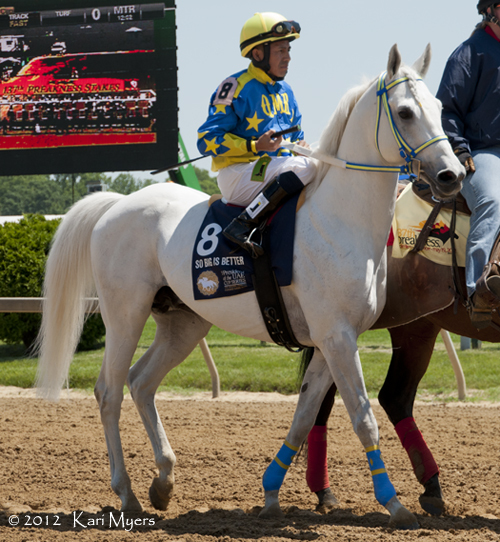 On the undercard of the 2012 Preakness, Pimlico played host to a Grade 1 Arabian race: The President of the United Arab Emirates Cup Series. 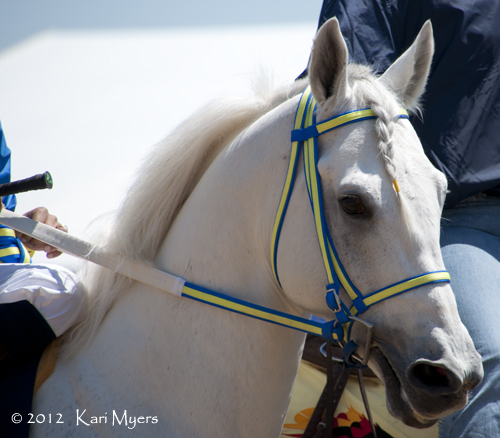 This race is for purebred Arabians, and is held at a different track each year. Since this year’s edition will be held tomorrow (Saturday, June 15) at Churchill Downs, here’s a look back at some of the field from last year’s race at Pimlico (May 19, 2012). This will be only the 2nd Arabian race held at Churchill Downs in the history of the track! 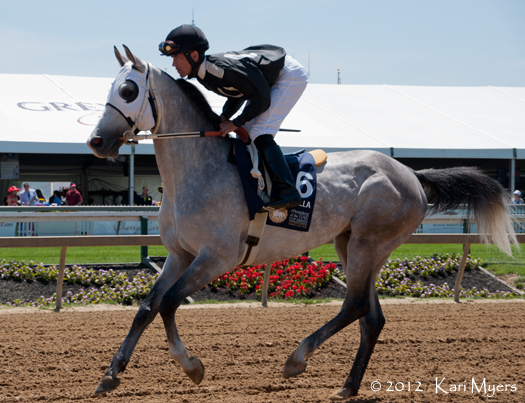 T M Fred Texas leads the cavalry charge of greys to win the 2012 running, with Grilla just behind in 2nd. T M Fred Texas is quite the international star. He’s won countless races, including the 2012 running of this race, and was last seen in one of the Arabian stakes on the undercard of the Dubai World Cup. Grilla finished 2nd last year, but has won his share of races and has competed against some of the best. Rich Frynchman finished third in 2012. So Big Is Better finished 4th last year, but will try his luck again this Saturday. So Big Is Better… so beautiful! 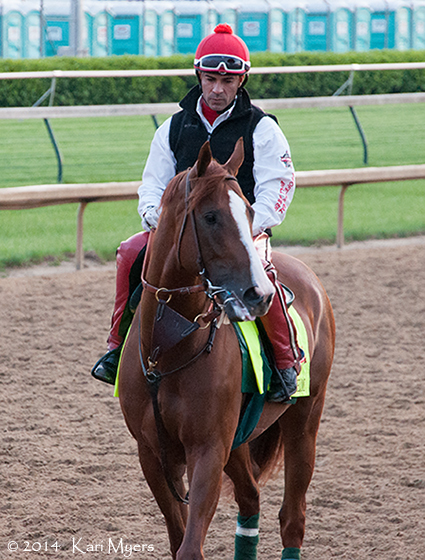 Spin Doctor will run in this year’s edition of the race at Churchill Downs. Dixie’s Valentine was the only mare in the 2012 field. Status Symbol, covered in dirt and still lovely. 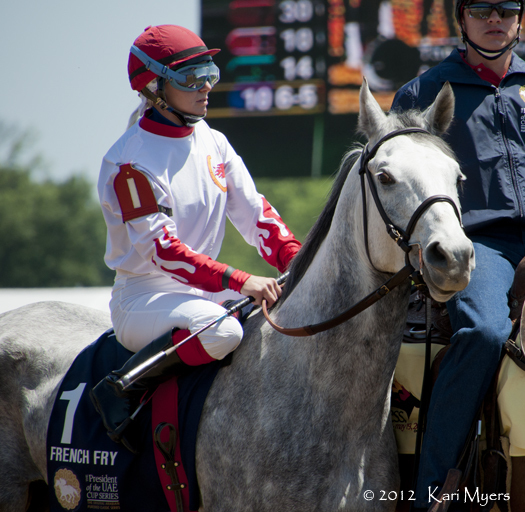 French Fry didn’t run well last year and ended up finishing last, but he looked like he was having a great time cantering around the track and checking out the crowd! May 2, 2013: Palace Malice takes an early morning gallop at Churchill Downs. Palace Malice, Oxbow, and Orb ran 1-2-3 in the Belmont Stakes on Saturday. How can you not love them?! I didn’t make it to the Belmont this year, though. In fact, I’ve never actually even been to the track. I’ve flown over New York once, does that count? But I did watch the Belmont Stakes on television and was very pleased with the results. 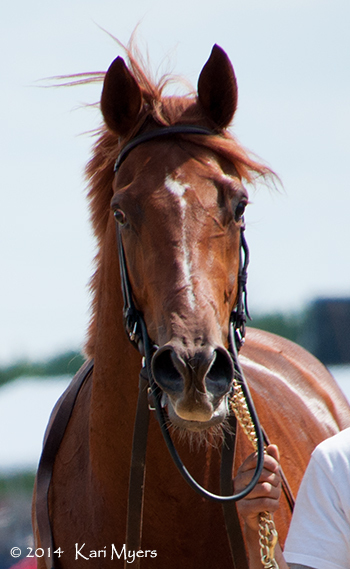 The winner, Palace Malice, is a colt from Curlin‘s first crop–and I really loved Curlin. It’s a little ironic that Todd Pletcher trains Palace Malice, since it was Pletcher who denied Curlin a win in the Belmont in 2007 when his filly Rags to Riches won by a neck. That’s okay, though. I’ve forgiven them for beating Curlin… mostly! It’s also interesting to note that Oxbow and Paynter are both by the stallion Awesome Again out of full sisters to the dual-Classic winner Tiznow. This makes them very closely related, and now they have something else in common: both finished 2nd in the Belmont Stakes (Paynter finished 2nd in 2012 to Union Rags). 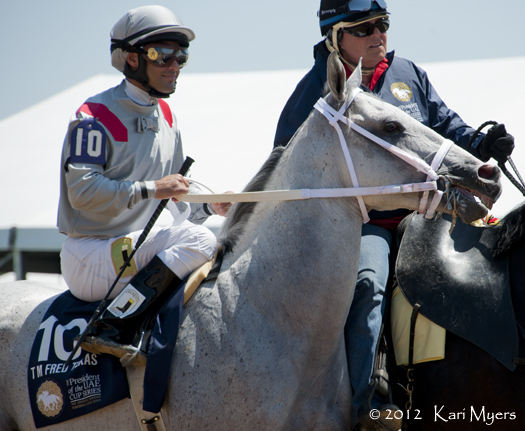 I have tons of photos from the other two legs of the Triple Crown. This collection mainly highlights Orb, but that’s just because I saw him everywhere I went at Pimlico! 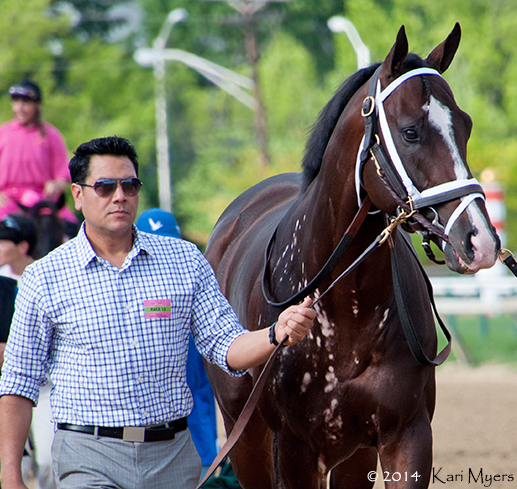 May 2, 2013: Oxbow at Churchill Downs. 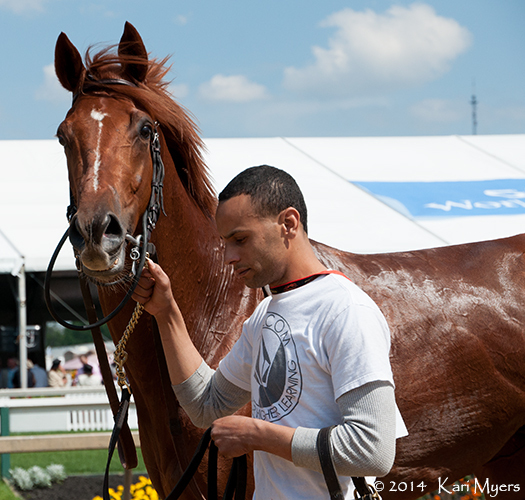 May 18, 2013: Orb heads to the paddock at Pimlico with his exercise rider, Jennifer Patterson. 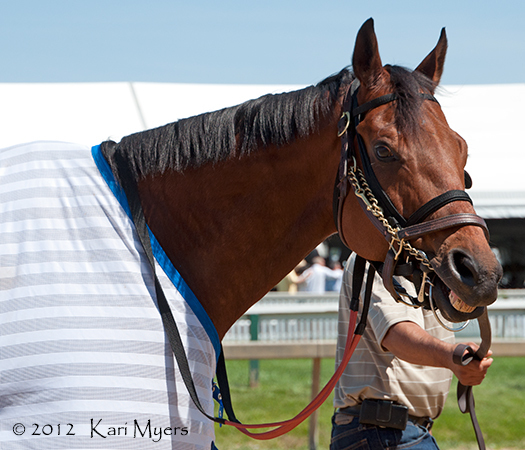 May 18, 2013: Orb heads to the Pimlico paddock before the Preakness. 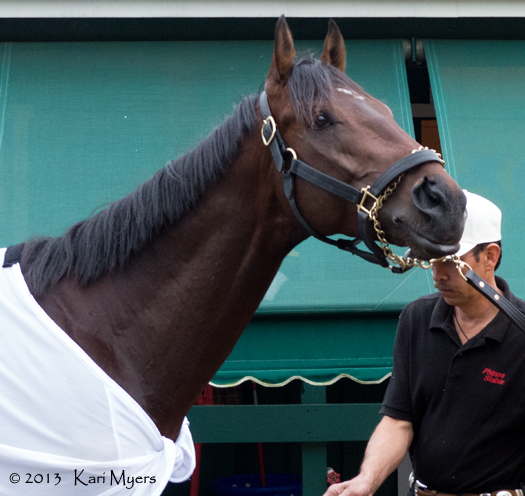 May 18, 2013: Orb checks out the other horses at the barn while he gets a post-Preakness bath. The old injury to his nose is quite pronounced. 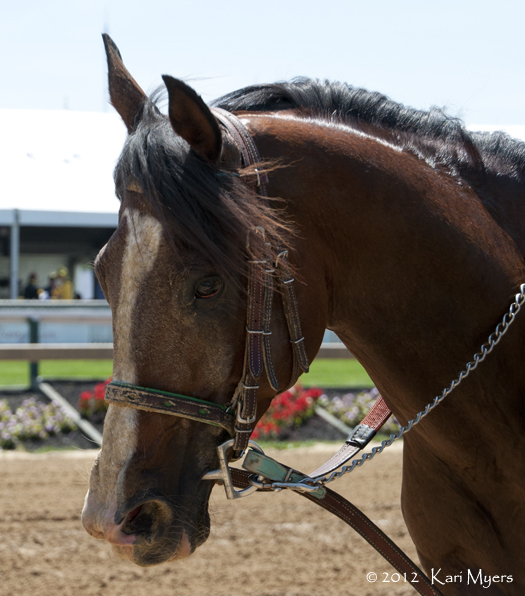 May 18, 2013: Orb has his legs hosed off after the Preakness. 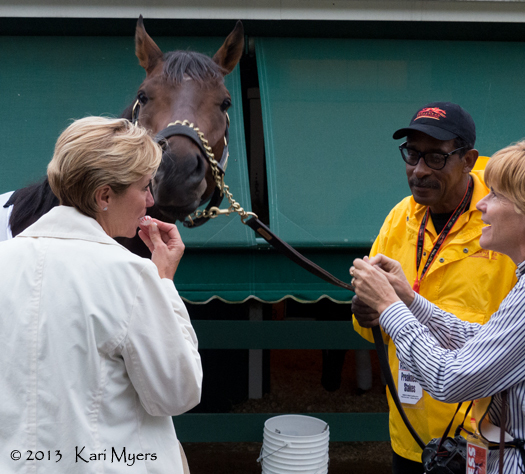 May 18, 2013: Orb waits impatiently for Alison McGaughey (left) and Barbara Livingston to unwrap his peppermints.